From women’s rights to the underground railroad, history plays a huge part in the makeup of the Finger Lakes Region. This weekend, June 17-18, 2017, celebrates New York’s Path Through History – a weekend showcase of New York’s rich and fascinating history, featuring hundreds of events happening at historic and cultural destinations across the state. Now – No end date. Becoming American: The Italian Immigrant Experience in Cayuga County (Auburn, NY) – Thousands of Italian immigrants settled in Cayuga County in the late 19th and early 20th centuries. This exhibit focuses on the journey from the “Old Country” to the new world, the challenges met by the immigrants, and the contributions of Italian Americans. Celtic Faire at GCV&M (Mumford, NY) – The Celts in Western New York played a major role in shaping the history of the Genesee Country. This special festival will celebrate the culture, history, and traditions of the Scots and Irish through musical performances by regional pipe bands, dance demonstrations from local schools and an array of authentic food and drinks to satisfy your palate. Path Through History: 1816 Farmington Quaker Meeting House (Farmington, NY) – Visit the meeting house, under restoration; see the poster display of its historic role in justice and equality for Native Americans, African Americans and women, have refreshments. Booklets are available for purchase for our self-guided driving tour of nearby related historic sites. The Old Time Fiddlers Gathering and Folk Arts Festival (Watkins Glen, NY) – Old Time Music, Workshops, and Crafts of Regional Cultural Groups. Because of Women Like Her Exhibit (Rochester, NY) – Discover the stories from Rochester’s past about the struggles and triumphs for women’s suffrage in New York State. See an eclectic mix of historical artifacts like Susan B. Anthony’s dress, Martha Matilda Harper’s prototype for the original salon shampoo chair, a Bloomer costume, a variety of suffrage banners, pendants, and flyers. Free and open to the public. Susan B Anthony Legacy Event (Canandaigua, NY) – This event commemorates the historic event when suffrage activist Susan B. Anthony was tried and convicted for voting at the Ontario County Courthouse in June 1873. Celebrate her legacy, and learn how the efforts of other from Ontario County were influential in the women’s suffrage movement. Anti-Suffrage Tour of Rose Hill Mansion (Geneva, NY) – Why would women oppose voting by women? Agnes Swan Hutchins, who grew up at Rose Hill from 1864 to 1890, was one of those who did. On this tour, visitors will learn more about Agnes Swan’s life and upbringing, and what may have led her to oppose formal political activity by women. Exhibit Opening-Political Postcards on Suffrage (Penn Yan, NY) – The grand opening of a temporary exhibit entitled “Political Postcards” will be held inside the women’s suffrage exhibit “Hear Our One Voice”. The temporary exhibit is on loan from the Susan B. Anthony Birthplace Museum in Adams, Mass. The Sodus Bay Phalanx and Women’s Suffrage (Sodus Point) – Town of Huron Historian Rosa Fox will discuss the history of women’s suffrage around the Sodus Bay area. Tea & Lecture: “Orchestrating Change: Amy Kirby Post and Women’s Right, 1828-1888” (Rochester, NY) – The National Susan B. Anthony Museum and House welcomes Nancy A. Hewitt, PhD, Emeritus Professor of History and Women’s Studies, Rutgers University to speak at this Monday Lecture Series. Old Ways Days at the Ward O’ Hara Agricultural & Country Living Museum (Auburn, NY) – Come back to the 1800’s when life was much simpler and families were the center of one’s life. Visit the Country Store, Country School, Country Kitchen, Country Parlor, Country Bedroom, Blacksmith Shop, Pottery Shop, and the many exhibits of rural life, expanding Auburn Industries and life in Auburn and Cayuga County in the 1800 and 1900’s. Ansley Schoolhouse Tour (Geneva, NY) – Come visit the only fully restored one room school house in Ontario County. Free and open to the public. Donations accepted. The 1890 House Museum: Explore Cortland’s Gilded Age at Path Through History Weekend (Cortland, NY) – The 1890 House Museum is offering discounted admissions prices and extended hours for the NYS Path Through History Weekends. Built for late 19th-century inventor and industrialist Chester Wickwire, the mansion is a large time capsule that illustrates the lifestyle of the wealthy Wickwire family, the servants, and the story of those who worked at the factory. Blacksmith Demonstrations at the Manlius Museum (Manlius, NY) – See demonstrations firsthand, from 1:00 – 4:00 PM, both days. Free and open to the public. Open House at the Overackers Corners One Room School House (Rushville, NY) – Join us for an Open House for the Overackers Corners School. A one-room school house built in 1874 and closed in 1937. Experience what it was like to go to school in the late 1800s and early 1900s. Collections, Collectors, and Collecting at Cortland Free Library (Cortland, NY) – Tours of the Historic Cortland Free Library will be available at 10a.m., 1p.m., and 4p.m. Collections on display include the History of Farm Toys, and American Clocks. Experts will be available all day to discuss these unique collections. Homer History Celebration (Homer, NY) – The Landmark Society of Cortland County is announcing the GRAND REOPENING of the Homer History Center in the beautiful historic village of Homer, NY. All are welcome to come and explore the local artifacts, memorabilia, maps and more that will be on display, and Landmark Society board members and volunteers will be on hand to welcome everyone and answer questions. Tour The Stickley Collections (Fayetteville, NY) – The Stickley brothers are essential in the story of innovation in design in New York, and also have made a lasting impact on American home life throughout the country. Gustav Stickley manufactured his furniture in nearby Eastwood, NY and his brothers, Leopold and John George, started their company in Fayetteville which would be called L. & J.G. Stickley. That Old House Tour: Dryden (Ithaca, NY) – Get an exclusive look inside beautiful homes & sites with this self-guided walking/driving/biking tour of selected interiors in the historic village of Dryden, New York, 12:00 – 4:00 p.m. Prior to the tour, attend “Celebrating Rural Heritage: Verne Morton’s Photographs” – As a prelude to Historic Ithaca’s Old House Tour, Bob Baxter, former CEO of Dryden Mutual Insurance Company, will give a guided tour of the 150 exquisite Verne Morton photographs that line the hallways of the company. For nearly 50 years local photographer Verne Morton (1868-1945) devoted himself to photographing Tompkins County rural and village life. The Underground Railroad in Western NY (Rochester, NY) – Rochester is emblematic of the strong efforts for freedom that NY has represented throughout history. Home of Frederick Douglass, it had pivotal connections with the most prominent abolitionist leaders during the mid-19th century. The tour visits National Freedom Trail sites and other Underground Railroad locations and is filled with powerful stories of the people who helped deliver individuals to freedom. Peppermint Museum Open House (Lyons, NY) – To celebrate NYS “Path thru History” weekend, the Peppermint Museum will have an Open House – Saturday, June 17th from 10-3 p.m. and Sunday, June 18th from 12-3 p.m. The museum is located at 95 Water Street in Lyons. It will feature two new exhibits: The Bicentennial of the Building of the Erie Canal and the NYS Centennial of Women’s Suffrage. The Story of that Adirondack Tragedy with Dr. Joseph Brownell (Cortland, NY) – Dr. Joseph Brownell will be at the CNY Living History Center for a talk and signing detailing his Adirondack Tragedy books. Relive the heart-wrenching story of one of the most famous crimes in New York’s history, the murder of Grace Brown by Chester Gillette at Big Moose Lake. Erie Canal 1: Basins and Builders (Rochester, NY) – The Erie Canal made Rochester a boom town and had national impact. Discover famous and less-well-known people with connections to this legendary waterway. Rochester Subway Heritage Weekend (Rush, NY) – Celebrate the heritage of the Rochester Subway, which shut down in June 1956. Enjoy a real train ride on restored cabooses to the Upper Yard, and tour the largest collection of historic trains – including Rochester Subway Car 60 (currently under restoration). Steamboats of Seneca Lake (Montour Falls, NY) – The Steamboats of Seneca Lake exhibit with focus on the steamboats, routes, and the passenger experience. Father’s Day Car Cruise (Canandaigua, NY) – Celebrate Dad with classic cars, food, flowers, and fun for the whole family. Genesee Valley Fare and Ware Festival (Castile, NY) – A festival to celebrate the food, drink and art of our the Genesee Valley region. The event will feature tastings and sales of beer, ciders, spirits, wines, foods and works of art. Path Through History: “Onohgwa” – Corn Soup (Victor, NY) – Join us for New York State’s Path Through History! Enjoy a guided walk along the Trail of Peace and visit our full-size Bark Longhouse replica to sample traditional Seneca Corn Soup from our heirloom Iroquois White Corn. Father’s Day Strawberry Festival (Camillus, NY) – Come and enjoy a strawberry shortcake on the lawn of the 1856 Octagon House, which will also be open for free tours. Fathers are treated to a free shortcake when accompanied by children. The Wilcox Octagon House is accessible from the subbasement to the cupola where you will have a beautiful view of Camillus, NY. Waterman Center’s Annual Father’s Day Breakfast on Hiawatha Island (Apalachin, NY) – Climb aboard our pontoon boat for a ride to Hiawatha Island, the Jewel of the Susquehanna. Once there, explore this one of a kind historical site and wildlife refuge. Enjoy a big farm-style breakfast cooked over open fires while learning of the unique history of the island. 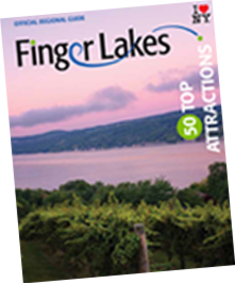 For more Path Through History events happening in the Finger Lakes Region through 2017, visit: https://paththroughhistory.iloveny.com/regions/finger-lakes/#.WUFdchMrJQM.